The Blackheath Society are holding their big meeting of the year on Thursday. I think you have to be a member to show up, but I’m not sure how stringent they are about checking… And if you wanted to join there and then, I suspect they wouldn’t say no (it is £15 per year, ie £1.25 per month according to my sub-GCSE maths skills).. Anyway, if anyone else has never been before, I’d be interested to know your thoughts… I’ve finally joined, although haven’t been to any meetings, I’m ashamed to say, and can’t get to the one on Thursday either. You can find out more on their website, although some of the links seem to have broken. There’s an extra “documents” word in some of the links that shouldn’t be there, if that makes any sense. How many inspectors does it take to catch a fare dodger? Well, let’s think… One to check the tickets, and one to do the booking? No, maybe one to check the tickets, one to do the booking, and one to grab the dodger? Okay okay, two to check the tickets, one to book the dodger, and another one to hold him down… So that’s four. Maybe one more to chase them if they run off? And a couple more to stand around looking officious… Yes. 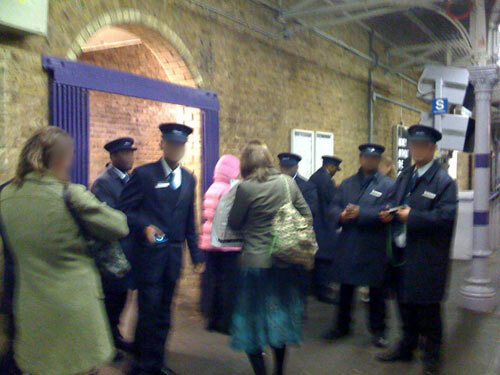 Seven ticket inspectors for the only exit at Blackheath station from the platform coming back from London. And they wanted to see the photo after I’d taken it. Probably to check that I captured their good sides. I know they’re just doing their jobs, and really, that’s fine. But you me and everybody else sweating on those miserable trains is paying £712 a week year for this. It ain’t great. They didn’t even reply to my email yet. Presumably another seven people are looking into it as I type this. 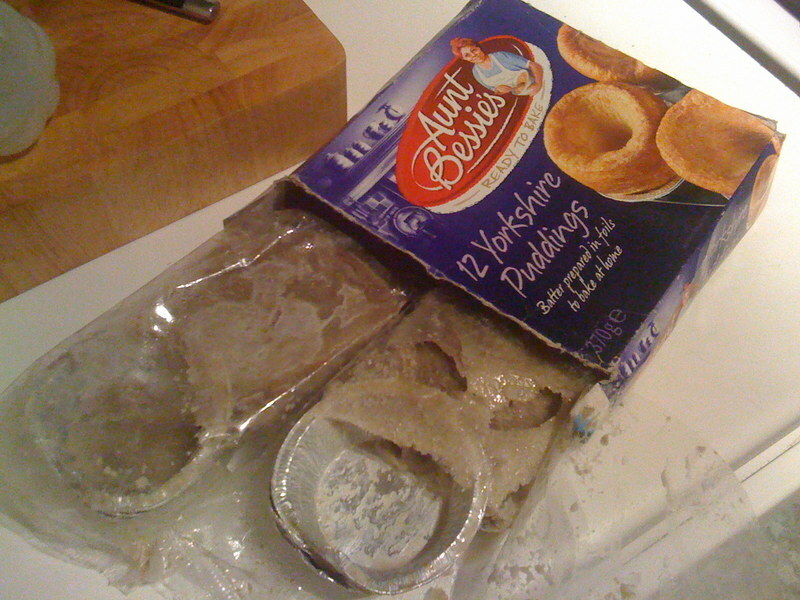 Having had a couple of dodgy bits out of their freezer, and turning stuff down due to decidedly shabby looks, today has taken the biscuit. Do you think that there is any chance you could lay on some long trains during the rush hour? 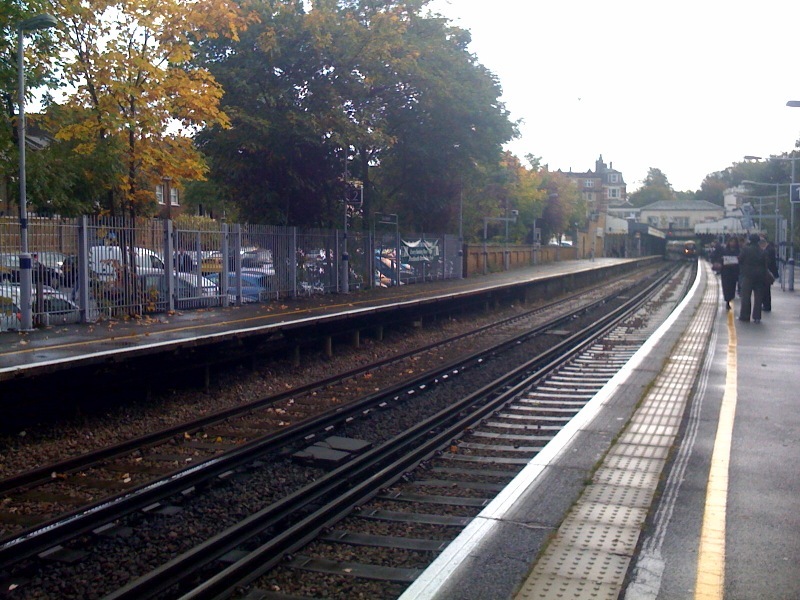 Every morning I see several carriages worth of empty space along Blackheath’s London-bound platform. I realise that it is really too late to complain, as you’ve already got my £712 for this year, and, for some reason, this doesn’t actually purchase me a seat on your lovely trains, but if you possibly could see your way to putting on a full train or two, it might make our journeys to work a little less sweaty. Of course, if I don’t like it, I realise that I am free to take my business to one of the many other Train Operating Companies departing from Blackheath to Charing Cross. Perhaps some sort of Service Level Agreement based on the rules around battery chicken farming could be introduced? The cache is back… perhaps it never left? 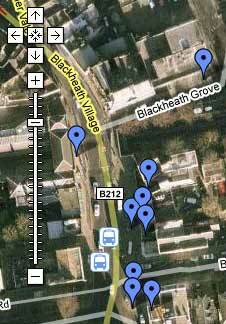 The Bugle’s Geocache has been resurrected – which makes me wonder if it ever disappeared in the first place. Anyway, if you manage to hunt it down, please let me know… So far it has been a bit on and off! I’m pretty myopic at the best of times, but I’m fairly sure that I saw the Crystal Palace Transmitter as the 108 bus rose over the hill, coming back on to the Heath from the Royal Standard. When it is clear like that, it’s nice to look out across the horizon, and wonder what other beings would make of this place. Do we worship tall things? The spire of All Saints church really does cut through the skyline of Blackheath – it’s almost impossible to see anything else – your eye is so drawn to it, as you head over the heath. The Google Map satellite view gives a striking impression – just look at the shadow lying across the grass. It reminded me of other places – we show what is important to us by pointing up to the sky. It’s harder to use Google to figure out whether it was the crystal palace transmitter that I saw behind the church – there isn’t enough elevation information available online – it all seems to be jealously guarded behind pay-walls (unless you’re looking for Martian elevation data, in which case you can take all you like!). It also reminded me of the wonderful dinosaurs there (in Crystal Palace park, not the church…) Well worth a look if you’ve never seen them.